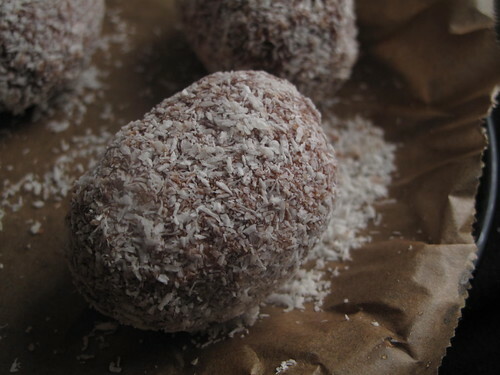 Easter Egg Lamington Cake Pops…That Were Not! Rhema. The revelation word. A-ha moments – they happen every day. Simple statements filled with deep insights which cause one to take pause and reflect. So it was that a colleague and I were chatting, at the coffee machine. Discussing the vagaries of life and its imminent changes. I said to him, something about ‘ hoping for the best but planning for the worst case’, to which he responded ‘ Truth is, it’s not the worst case scenario that’s the problem, it’s the unexpected.’ The one event you didn’t, couldn’t plan for….that’s the issue. 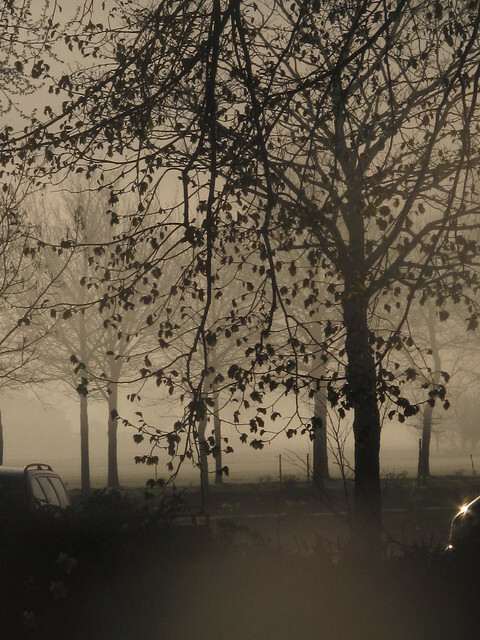 I mean take thick mist on a bright Spring morning – how unexpected is that? Beautiful but in my tropical mind…unexpected. I have had my recent share of those – some captured in this post and others….will reveal themselves in the future. However, when I first saw Penny of Jeroxie’s IIP cake pops party, I signed up immediately. 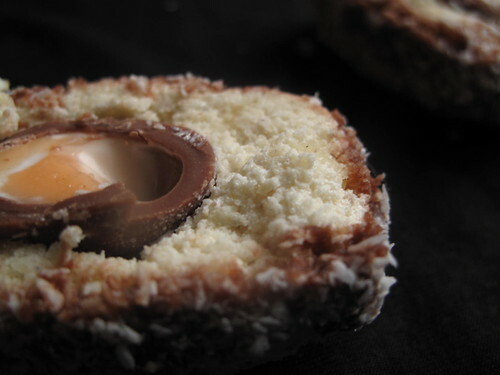 I knew exactly what I was going to make…..a sneaky chocolately cake pop, riding on the coat tails of Easter eggs, lamingtons and ‘chocolate’ scotch eggs. I worked myself into a frenzy that I forgot the essentials like – lollipop sticks, frosting for the cake, and other ‘long-lead’ items which I could have thought of much sooner. But a tale with a happy ending, as I had no hope in finding lollipop sticks on a Sunday in the Netherlands. A rummage in my kitchen cupboards revealed lollies. Pretty lollies which were promptly separated from their carriers. Apparently problem solved. Unexpected tale #2- Gigantic cake pops…..are too heavy, for afore-mentioned sticks! My assembly of the cake pops was easy. 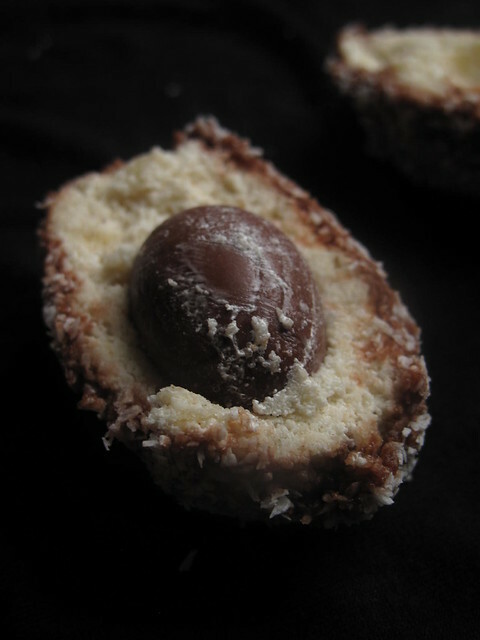 Centres of Cadbury’s chocolate crème eggs, perfect for Easter formed the core. A cushion of cake crumbs and marshmallow fluff surrounded it and the finish was chocolate glaze and a crust of desiccated coconut. Would you believe that the sticks could not, would not find a place to stick and stay. All attempts to set them daintily and name them lollies, failed….miserably. Need I say that the sticks have been set aside for another day. Have you ever tried marshmallow fluff? It is spreadable marshmallows….with a thick, shiny consistency that resembles whipped eggs whites, and a texture that makes it the perfect glue. However my cake was sweet. As was the lamington glaze. And the sweetened desiccated coconut. The multiplier effect was very noticeable in the finished product – even a plain, strong black coffee would have had a tough time. A great concept though but one which has gone back to the design board. Next time, I’ll use a different sort of chocolate centre, use proper frosting and make the chocolate coating out of melted chocolate and not a mixture of icing sugar and cocoa. But of all these, it was the final unexpected tale that has me wondering. Because in a fit or orderliness while transferring my photos from my SD card to Flickr ahead of a weekend in Paris that resulted in me selecting the photos of the cake pops….and then hitting delete before I could say ‘A’. If I didn’t know about the downsides of multi-tasking already, I’d have learned the lesson again…. I panicked, ran straight to Google and downloaded ‘free’ photo recovery software. Except when it was time to recover the photos which I could see….it brought up a bill of under $40. At which point I paused and went to bed. Because that would be a waste of money. What if I thought those were some of the best photos I’ve taken. Does that justify spending that amount…..just to show the world again ‘ some nice food photos’. In the end, I didn’t use the software, struggled to take some decent photos before nightfall on Thursday night and then got on a plane Friday morning. Have you ever wiped out photos for a post? Bringing me to my last and final unexpected tale . 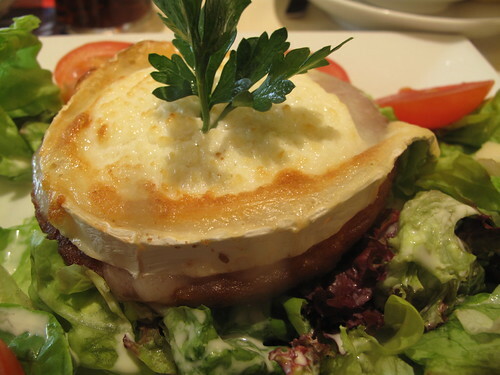 Just leaving the Trocadero, and feeling sated from a lovely lunch of goats cheese on a potato cake, my camera took its last gasps….and died. I’ll be honest, I have no idea what I’m going to do!!!!!!!!! To tell the truth, this wasn’t totally unexpected as my camera has been giving me signs for the last few months. It is times like this I am thankful for the hundreds of photos in my archives….yet unposted! 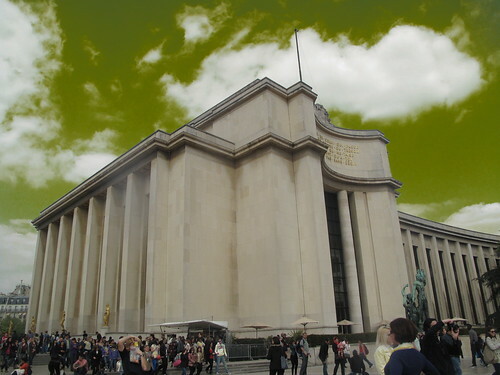 How pleasant the unexpected can be though………………namely, green clouds…when playing with colour swaps and accents on my camera. 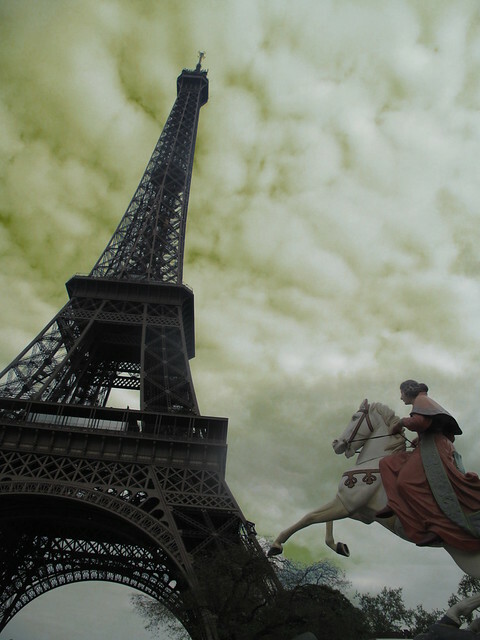 Doesn’t it look as though the lady on the horse is riding to the Eiffel tower? Thank you Penny for being a great hostess. Please see what other popsters brought to the party…..